'So, the next time someone with a limited budget asks what preamps they should buy first, you'll have a really good answer. I don't know another product with this range of versatility anywhere near the Camden 500's price point." The award winning Cranborne Audio Camden 500 Series preamp & signal processor continues to impress the critics. The Camden 500 receives another fantastic review this month, this time courtesy of Tape-Op magazine. "I liked the sound of the Camden 500's transparent preamp. As compared to another transformer-less transparent-style preamp, the Camden 500 did indeed sound very natural." "As you crank the Mojo knob clockwise, the effect gets obvious. Aside from the subtle transformer emulation, it starts adding a good deal of additional harmonic content below 100 Hz. I found that this works wonders on low frequency sources such as kick drum or bass guitar. In this case, I could dial in an incredible low end on the kick, without it sounding synthetic or out of place." 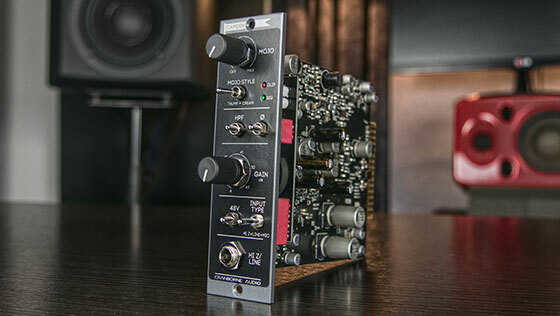 "At a street price of $349 you could put a pair of these in a 500 Series rack for likely less cost than a single channel of many other preamps. Then you'd have the ability to dial in neutral and transparent tones, thunderous low end tones, or thick harmonic tones depending on what was needed. As a bonus, selecting the line level input allows you to run your entire mix through the Mojo circuit. Pretty cool!" The full Tape-Op magazine review can be read here. The Cranborne Audio Camden 500 is available now priced at £299 RRP inc VAT. Cranborne Audio is distributed in the UK/ROI by Sound Technology Ltd. For more information please call 01462 480000 or visit www.soundtech.co.uk/cranborne-audio.